Baan Leelawadee is a seafront cluster of five pavilions featuring contemporary tropical luxury. Areas are appointed with predominantly beautifully crafted dark and woven wood furnishings and fixtures with a few modern and chic pieces. Amenities are essentially of hotel and resort grade – to guarantee each and every guest’s pure pleasure and indulgence. Baan Leelawadee, truly, extends to you an exquisite escape amidst a coastal atmosphere. The villa has four air-conditioned bedrooms. The master bedroom – in a single pavilion adjoining the living pavilion – has a four-post and draped, king-sized bed, as well as a dedicated bathroom with a fitted bathtub and indoor plus outdoor rain showers. The master bedroom has direct access to the infinity pool. Two guest rooms share one pavilion. One bedroom has twin beds, and the other bedroom has a double bed. Both bedrooms have dedicated bathrooms with rain showers. Another guest room – in a two-storey bedroom pavilion – also has a king-sized bed, as well as a dedicated bathroom with a rain shower. This bedroom opens out to a balcony with 180-degree views of the seascape. Alongside the white sand beach is the 17-meter infinity pool. After your morning swim in the sea, jump into its mesmerizing, glassy fresh waters because you surely just can’t get enough of your element. From the water, you can stretch out on woven wood pool beds partially shaded by large umbrellas on the poolside wooden deck. 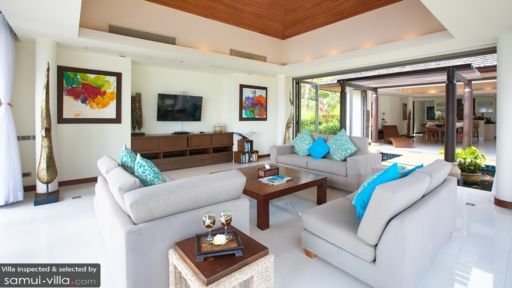 Or, sit back on the cushioned, woven wood sofa or day beds under the shade of the poolside sala. 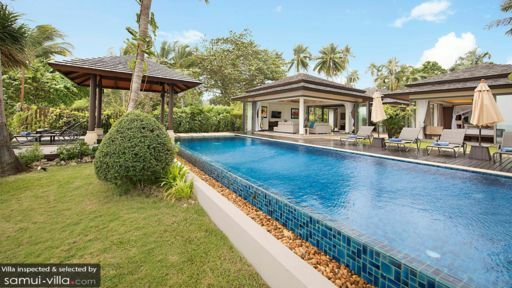 At the villa’s semi-open and breezy living pavilion – around large sofas facing a wall-mounted, widescreen TV – you can all catch shows you’ve been following closely. Or, go on a marathon of your can’t-get-enough-of movies. Joined by a pergola covered stone pathway that crosses a pond is the dining pavilion with its long, wooden table that accommodates 10. Here, you can all indulge in authentic local specialties – as well as Western staples – masterfully prepared by the in-house chef at the fully-equipped, ultra-modern kitchen perpendicular to the dinner table. The counter which borders the kitchen can also be used as a bar for meals, brews or mixes. The amiable staff of the villa delivers – aside from general housekeeping and maintenance – services that put everything at your convenience. Baan Leelawadee is based right on Bo Phut Beach. Swim to your heart’s content then stroll along its two-kilometer stretch. At some point, you’ll stumble upon Fisherman’s Village where you’ll find historic buildings as well as – if, by chance, it’s a Wednesday – the weekly Walking Street. On a separate day trip, head to the Samui Big Buddha and the Samui Crocodile Farm. If it’s excitement you’re after, hit the tracks of Samui Go Kart. I stayed for 5 days, it was a wedding of my dearest friends. Stuff is very friendly and helpful, always with a smile. Excellent chefs and fabulous food. Beautiful surrounding and great view. Each villa has own pool, kitchen and living room, very convenient and private. Rooms are clean and well decorated. The villa and gardens were amazing with wonderful views over the infinity pool out to sea. 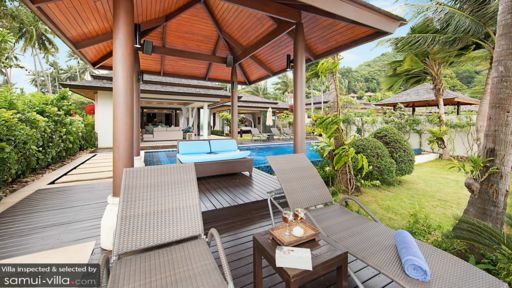 The villa is at the far end of the Bo Phut beach and so, is quiet and peaceful...ideal for a relaxing retreat. The staff were friendly, helpful and incredibly efficient and "chef" provided some of the best meals we ate in Thailand. Highly recommended. We absolutely loved our stay here! Our whole family spent six nights enjoying Thai hospitability and each other's company. It is the perfect option with children, as you can maintain some form of routine, whilst enjoying some R&R. The property was lovely, and the staff were absolutely fantastic. They looked after us incredibly well, and we enjoyed cooked meals most lunchtimes and evenings. We also celebrated my Mum's 60th birthday here. A really amazing evening! They placed the table outside for us, we had an amazing dinner, and set off lanterns later on. My only one piece of feedback is that all of the bedrooms are separate, and not connected to a house as such. As a mother, that did make me a little nervous, but it worked out fine. I would definitely like to return. Can't wait.